I always get kitchen gadgets for my birthday – and I still have a wish list. When we got back from overseas the dog sitter told me she had made very good use of most of the gadgets. However, she did not want to try using my pasta machine alone. So, I invited her over for a lesson and at the same time made nero pasta with the squid ink we got in Italy. I found the squid ink at a little shop in the old city of Sienna and Dave told me to rather get it the next day – but I decided it was not a problem to carry it around while we were walking through the old city, and to make sure it was safe while we went out to eat. The squid ink cost €0.95 for 2 portions so not cheap when you compare it to the cost of making your own pasta. Hopefully I can find some more of the squid ink here as I thought the pasta looked amazing. 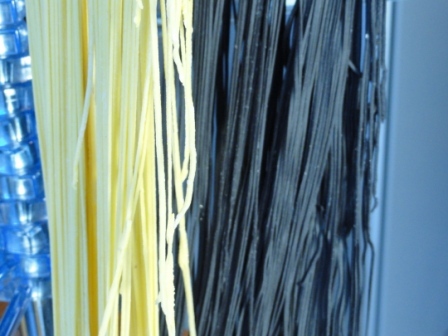 The colour of that black pasta is fabulous! 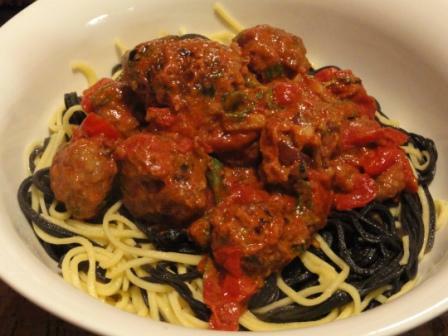 I made the most amazing meat balls to go with this with a bright red tomato sauce! It looks impressive enough to justify the cost Tandy.